With the bull market entering its tenth year and interest rates increasing, what’s worked so well since the GFC, including buying high growth stocks, defensive businesses and high yielding stocks, is unlikely to work well through the cycle’s next phase. US growth stocks have officially registered their longest ever winning streak over value stocks. It seems only a matter of time before the unusually low level of volatility that’s characterised markets in recent years is replaced by more normal levels of volatility and returns. Most of the questions on investors’ minds currently surround the risks of a large fall in the sharemarket due to higher interest rates. 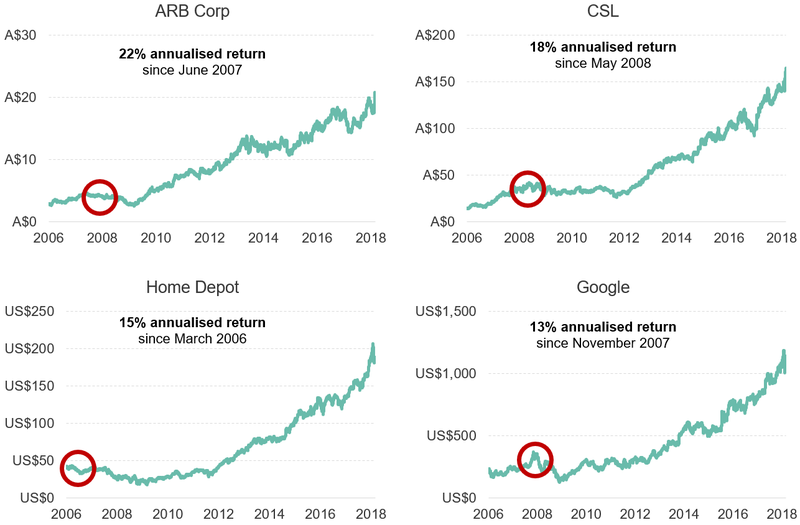 But before we address that fear, let’s see what you would’ve earned had you bought the following four well-known companies at the absolute peak of the bull market that triggered the GFC (refer to Figure 1). ‘Far more money has been lost by investors preparing for corrections, or trying to anticipate corrections, than has been lost in corrections themselves’. In all four cases, despite the markets hitting historical peaks, their stock prices were undervalued due to gross misjudgements. ARB Corporation is one of Australia’s best businesses, but the market thought high oil prices would kill demand for four-wheel drive accessories. CSL is a difficult business to handicap, but its share price languished due to a plasma supply glut. The same thing had happened years earlier and decimated profits, but the market was far more consolidated second time around and the glut didn’t last long. Home Depot (the US version of Bunnings) was poorly run in 2006 but eventually the CEO left, and it’s been a phenomenal investment since, despite its exposure to the US housing market during the GFC. Google was thought to be a mature, one-trick pony, but has made some excellent investments since, including YouTube for an unbelievable US$1.7bn. Some estimates currently value it at 100x that. These are just four examples out of hundreds, but the key point is that the fundamentals of a business and its valuation are far more reliable predictors of future returns than economic and market fluctuations. In fact, it’s been shown that US rainfall has a higher correlation to stock returns than GDP. Lynch also said that ‘If you spend more than 13 minutes analysing economic and market forecasts, you’ve wasted 10 minutes’. His point is that forecasting changes in macro-economic variables is so difficult that few, if any, can predict them consistently to make money. That’s not to say that the macro environment isn’t important. Our portfolio is mostly made up of businesses whose products and services are recession resistant, but we won’t receive full value for our European bank holdings unless interest rates increase. Keep in mind that nine years since markets bottomed in 2009, the official interest rate in Europe is still negative 0.4% i.e. banks are paying to hold money with the European Central Bank. With European economic growth beating US growth at one point last year, higher interest rates could be less than a year away. If the US experience is repeated, that’s when valuations for European financials will start closing the ~40% gap to their long-term valuations. Analysing the impact of the economic environment on the businesses you own is just one of hundreds of questions we consider in our analysis. As research continues to show year after year, the reason most individuals don’t earn anywhere near the same returns as the funds they invest in is because they try to time markets. They typically buy high and sell low, without much, if any, opinion on the value of the stocks in the portfolios they’re selling. So, what are the key lessons here? First, preferring preparation over prediction, we build your portfolio to survive the worst economic conditions by focusing on the number one or two players in their respective industries. We also demand a margin of safety in the price we pay for each stock, regardless of how great we consider the business. But as the world is beset by uncertainty and technological change, as a final layer of protection we have a diversified portfolio so that no single mistake or stroke of bad luck can have a lasting impact on your investment. Thinking back to the four stocks discussed above, our process means little without the patience and wherewithal to stay invested during times of duress. Many investors right now are fearing that the market reaper is going to carry their portfolios out in a casket in a redux of the GFC. If we owned many over-priced businesses (via an ETF or index fund, for example), or had a large, debt-fuelled one way bet on an asset increasing forever that only pays off if interest rates stay low, then we’d be worried too. Falling asset prices under this scenario tend to be permanent, not temporary like the GFC was for many high quality and safe businesses including the four businesses discussed above. It’s our job to buy those businesses and steer clear of the over-valued ones. Bear markets produce incredible, but rare opportunities to increase returns and reduce risk, and shouldn’t be feared if you’re prepared. Instead of fearing market downturns, we must be prepared to embrace them. Or, as a mentor once said, if you’re going to panic, panic early.